Tenant News at Tranquility Place, 123rd & W. Maple Rd. 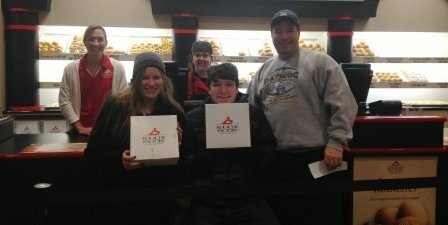 Photo: First Kolache Factory customers, the Harrell Family of Omaha, NE. Exciting things are happening at Tranquility Place, 123rd & W. Maple Rd. Today is the grand opening of the Kolache Factory. This is the only location in Nebraska and we are excited to have them as a new tenant! A kolache is a warm, delicious, slightly sweet fresh-baked pastry traditionally filled with sausage, cheese, or fruit. The kolache originated in Eastern Europe, and dates as far back as the 1700’s. The original product was a pastry filled with fruit. Kolache Factory makes its pastry dough using its time tested recipe. Our pastries are filled with a variety of the freshest ingredients including fruit, meat and cheese. Kolaches are self-contained and neat to eat. They can be conveniently consumed anywhere, from the car, to group or business meetings, to the baseball field. Kolache Factory features 25 different kolaches that are perfect to eat anytime. Kolaches are the ideal choice for a nutritious, “on the go” meal. Also, at Tranquility Place, Bene Pizza and Pasta will be featured on Restaurant Impossible (Food Network) Wed., February 18th at 9:00 pm CST and re-air on Thurs., February 19 at 12:00 am CST and Sat., February 21st at 1 pm CST. Investors Realty Arranges $16.8M Sale of Centro Plaza in Lincoln, Neb.